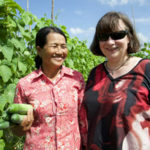 Facing the Global Food Crisis: Using trade and aid for a food secure world was a forum and networking event to address food security and showcase work by NSW institutions and its impact in NSW and in our region. 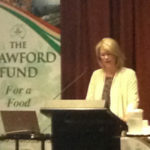 In her address at our NSW ‘Doing Well by Doing Good’ event on 18 March, The Hon Katrina Hodgkinson MP, NSW Minister for Primary Industries, acknowledged the leadership of the Crawford Fund in training for development, expressed support for a collaborative approach to international agricultural research and confirmed the belief in the benefits of the work to Australian agriculture. The half day seminar in NSW Parliament House titled “Facing the Global Food Crisis: Using Trade and Aid for a Food Secure World” attracted an audience of approximately 100 people who were from diverse interests across agriculture, science, research, academia, NGOs and agri-business, with a large welcome contingent of young agricultural science students. 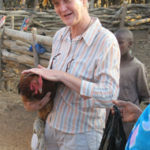 Presentations by a group of NSW researchers highlighted the breadth and impact of their international work, at home, overseas, personally and professionally, and included the presentation of a number of videos developed with ACIAR through the Fund’s Public Awareness Campaign (see below). “The work that has been highlighted …., representing a diverse range of NSW-based research teams, is inspirational,” said the Minister. 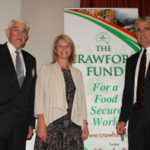 “The importance of delivering skills through training programs and the networks that develop cannot be underestimated, and I acknowledge the leadership of the Crawford Fund in this area, which carries on the ideals of Sir John Crawford of promoting research to help feed a hungry world,” she said. The Minister, in noting ACIAR’s strong pipeline of some 92 projects in NSW, valued at $136 million, indicated that the NSW Government totally supports ACIAR’s efforts and shares the belief that international research has wide ranging and immense benefits to Australian agriculture. Can We Feed over 10 Billion People?